FREMONT, Calif., (GLOBE NEWSWIRE) — Aehr Test Systems (NASDAQ:AEHR), a worldwide supplier of semiconductor test and burn-in equipment, today announced financial results for its first quarter of fiscal 2018 ended August 31, 2017. Net sales were $7.0 million, up 31% from $5.3 million in the first quarter of fiscal 2017. GAAP net income was $10,000, or $0.00 per diluted share, compared to a GAAP net loss of $755,000, or $0.06 per diluted share, in the first quarter of fiscal 2017. Non-GAAP net income was $226,000, or $0.01 per diluted share, compared to a non-GAAP net loss of $436,000, or $0.03 per diluted share, in the first quarter of fiscal 2017. Backlog as of August 31, 2017 was $15.2 million. An explanation of the use of non-GAAP financial information and a reconciliation of the non-GAAP financial measures to the most directly comparable GAAP financial measures can be found in the accompanying tables. Announced today that it received follow-on orders totaling $2.7 million from a subcontractor of its initial lead FOX-XPTM Test and Burn-in System customer. The orders include a partially populated FOX-XP system, multiple DiePak® carriers for their next generation devices, and multiple DiePak loader/unloaders to increase their current production capacity. Announced earlier this month a $900,000 order received in the first quarter from its second lead FOX-XP customer to provide additional testing capability and power handling capacity to test and burn-in new silicon photonics that will go into production next year. Announced in late August its first volume production order exceeding $3.0 million for multiple Advanced Burn-in and Test System (ABTS™) thermal chambers from an OEM customer for a high-volume application. Announced during the quarter a follow-on order exceeding $1.3 million for multiple WaferPak™ contactors for its FOX-1 wafer level test systems for flash memory testing. Announced during the quarter a follow-on order exceeding $3.8 million for multiple ABTS test and burn-in systems from a leading multi-national manufacturer of advanced logic integrated circuits (ICs) for automotive devices. “We are off to a great start for fiscal 2018. We finished the first quarter with revenue of $7.0 million, GAAP net income of a little over break-even, non-GAAP net income of $226,000, which excludes non-cash related stock-based compensation expense, and a backlog of $15.2 million. With today’s order announcement for $2.7 million for our FOX-XP Test and Burn-in Solution products, this adds up to approximately $18 million in backlog early in our second quarter. We are very pleased with the installations of our new FOX-XP Multi-Wafer and Singulated Die/Module Test and Burn-in systems at our two lead customers, and both have purchased follow-on capacity and capability. “Earlier this month, we received an order from one of these lead customers to provide additional testing capability and power handling capacity to their previously delivered FOX-XP system in order to test and burn-in new silicon photonics devices that will go into production next year. And today we announced that we received follow-on orders from a subcontractor of our initial lead FOX-XP Test and Burn-in System customer. The orders include a partially populated FOX-XP system, multiple DiePak carriers for their next generation devices, and multiple DiePak loader/unloaders to increase their current production capacity. These newest orders continue to expand our production presence with this customer for multiple generations of devices. In addition, we have ongoing discussions with several additional companies about our new FOX-XP platform and we are optimistic about the prospects with these prospective new customers. “We continue to maintain our confidence in our growth forecast for the fiscal year ahead. We reiterate our previously provided financial guidance for the fiscal year ending May 31, 2018 of full year total revenue growth of at least 50% over fiscal 2017 and to be profitable for the year. 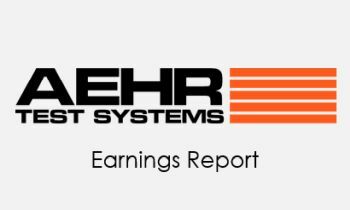 Aehr Test Systems will host a conference call and webcast today at 5:00 p.m. Eastern (2:00 p.m. PT) to discuss its first quarter fiscal 2018 operating results. To access the call dial 877-852-6576 (+1 719-325-2315 outside the United States) and give the participant pass code 4262658. In addition, a live and archived webcast of the conference call will be available over the Internet at www.aehr.com in the Investor Relations section. A replay of the conference call will also be available via telephone beginning approximately two hours after conclusion of the call through 8:00 p.m. ET on October 5, 2017. To access the replay dial-in information, please click here. Headquartered in Fremont, California, Aehr Test Systems is a worldwide provider of test systems for burning-in and testing logic and memory integrated circuits and has an installed base of more than 2,500 systems worldwide. Increased quality and reliability needs of the Automotive and Mobility integrated circuit markets are driving additional test requirements, capacity needs and opportunities for Aehr Test products in package and wafer level test. Aehr Test has developed and introduced several innovative products, including the ABTS and FOX families of test and burn-in systems, WaferPak contactors, and DiePak carriers. The ABTS systems are used in production and qualification testing of packaged parts for both low-power and high-power logic as well as memory devices. The FOX family of systems includes single and multi-wafer full wafer contact test and burn-in systems used for burn-in and functional test of complex devices, such as leading-edge memories, digital signal processors, microprocessors, microcontrollers and systems-on-a-chip. The WaferPak contactor contains a unique full wafer probe card capable of testing wafers up to 300mm that enables IC manufacturers to perform test and burn-in of full wafers on Aehr Test FOX systems. The DiePak carrier is a reusable, temporary package that enables IC manufacturers to perform cost-effective final test and burn-in of both bare die and modules. For more information, please visit Aehr Test’s website at www.aehr.com. This press release contains certain forward-looking statements based on current expectations, forecasts and assumptions that involve risks and uncertainties. These statements are based on information available to Aehr Test as of the date hereof and actual results could differ materially from those stated or implied due to risks and uncertainties. Forward-looking statements include statements regarding Aehr Test’s expectations, beliefs, intentions or strategies regarding the future including statements regarding future market opportunities and conditions, expected product shipment dates, customer orders or commitments and future operating results. The risks and uncertainties that could cause Aehr Test’s results to differ materially from those expressed or implied by such forward-looking statements include, without limitation, general market conditions, customer demand and acceptance of Aehr Test’s products and Aehr Test’s ability to execute on its business strategy. See Aehr Test’s recent 10-K, 10-Q and other reports from time to time filed with the Securities and Exchange Commission for a more detailed description of the risks facing Aehr Test’s business. Aehr Test disclaims any obligation to update information contained in any forward-looking statement to reflect events or circumstances occurring after the date of this press release. Non-GAAP net income (loss) is a non-GAAP measure and should not be considered a replacement for GAAP results. Non-GAAP net income (loss) is a financial measure the Company uses to evaluate the underlying results and operating performance of the business. The limitation of this measure is that it excludes items that impact the Company’s current period net income. This limitation is best addressed by using this measure in combination with net income (loss) (the most directly comparable GAAP financial measure). These measures are not in accordance with GAAP and may differ from non-GAAP methods of accounting and reporting used by other companies. We believe these measures enhance investors’ ability to review the company’s business from the same perspective as the company’s management and facilitate comparisons of this period’s results with prior periods. (510) 623-9400 x309 MKR Group Inc.